One of the major problems Microsoft encountered with Windows 8 was the drastic change in user interface from previous versions of Windows, and caused the biggest controversy amongst Windows users since Windows Vista was launched. With the release of the free update to Windows 8.1 for all users, Microsoft has tried to reverse some of those changes and make the interface behave a little more like previous versions of Windows, and Windows 7 in particular. Two things that Windows 8.1 re-introduced in an attempt to win users over was ‘Boot to Desktop, and the Windows Start button on the taskbar, however, clicking on this didn’t produce the expected Start Menu of previous versions of Windows, it just bought you back to Windows Start Screen. 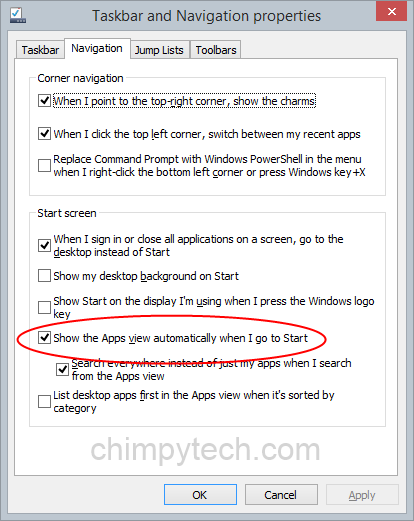 One little tweak that makes using Windows 8.1 a little easier is to change the action of the Start Button to display a list of all installed programs rather than the Windows Start Screen. Click the ‘Apply‘ button and ‘OK‘ to make the change permanent.